I don't understand the Zwan backlash post-2003. The criticisms against the alternative rock supergroup were pretty loud during the impending release of the New Smashing Pumpkins debut 2007 album Zeitgeist. In my opinion, Zwan outshines Zeitgeist, if only slightly. Zwan's one and only studio album, Mary Star of the Sea, is a classic. It borders on spirituality, but in a U2-esque, non-fundie Roman Catholic kind of way. It was optimistic in a time of uncertainty (the invasion of Iraq began at the time of the album's release). The guitars are thick and layered, in a Billy Corgan-meets-David Pajo-kind of way...well, literally, actually. Jimmy Chamberlin's drumming is consistently above par. Paz Lenchantin's bass playing goes above and beyond Corgan's longtime chick bass-player fetish of the past two decades (which I share as well). Additionally, Lenchantin's harmony vocals tame Corgan's signature whine in an unprecedented manner, as her vocals are actually in the final mix - unlike most Smashing Pumpkins records with Corgan thinly harmonizing with himself. I'm sure Matt Sweeney is also in the mix somewhere, but his contribution truly shines in the Djali Zwan's wild west adaptation of Iron Maiden's "Number of the Beast" from the Spun soundtrack. Sweeney's vocals on that track, as well as Zwan's acoustic arrangment, make the cover more badass than the original. "Beast" is not on the album, but I recommend that you track it down if you're interested. "Baby Let's Rock!" is probably the weakest track on the album, and while I can't hang with that song as much as the other thirteen tracks, it's still a solid song. The title track "Mary Star of the Sea" is such a great song, and I wish it was granted its own track. Unfortunately (relatively speaking), it's bundled together with "Jesus, I," which is a hard-rocking rendition of a hymn but also the third weakest track. It's a good song, but it's a given that there are songs better or worse than other songs in any given album. I'm glad I have an edited mp3 of "Mary" in iTunes so that I can listen to that epic (comparative to the Pumpkins' "Porcelina of the Vast Oceans") anytime I want, without manually fast-forwarding four minutes or so into the bundled track. The album closer, "Come with Me" is a catchy ditty, but falls between "Rock!" and "Jesus" in the lower portion of the quality spectrum. Again, listing the weakest tracks is not necessarily a bad thing, as those songs are pretty good by themselves. With the rest of the album far outshining those solid tracks, why is there such a backlash against Mary? Admittedly, Corgan's only F-bomb on "Yeah!" is consistently out-of-place, but the hooks of "Yeah!" 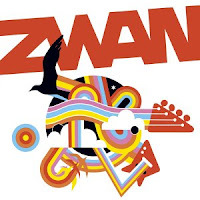 and pretty much every Zwan song are fantastic! If you can find it, I recommend the limited edition release of Mary Star of the Sea, with the documentary DVD. You'll kind of-sort of get to know the short-lived supergroup and hear extra tracks (albeit fragments thereof) from Zwan. The bottom line is this: 2/5 Old Smashing Pumpkins (or 100% New Smashing Pumpkins) + 3/5 indie rock credibility = a band that was (1) meant to craft such a marvelous album and (2) inevitably implode as soon as possible. While the latter wasn't a pleasant thing, at least they stuck together long enough to create the former.